Gravity-defying CEO pay is not a payment for talent. It’s not looting by the executives, either. It’s the outcome of principal-agent relationship in a market where new technologies combined with regulatory dereliction have created a lot of winner-take-all situations. * the concentration (i.e., inequality) of income within each share, from 1979 to present. The data are for the USA. The share of income going to labor has been declining for some time – since 1970 or 1980, depending on which data series you use. Since capital income is more highly concentrated (most working age adults have labor income, but little or no capital income), an increased capital share produces increased inequality even if nothing else changes. But, also, there’s been increased concentration (inequality) within both the labor and capital shares. Increased inequality within the labor share is well known. It is also well known that, in the distribution of overall (labor+capital) income, the top 0.1% have seen a much larger growth of their income than the top 1%, who have in turn seen a larger growth than the top 10%; and since those top slices of total income all get large shares of capital income, increased inequality within the capital share is no surprise. It’s nice, though, to see it plotted and explained so clearly. Riots, growing inequality, in …. Sweden? 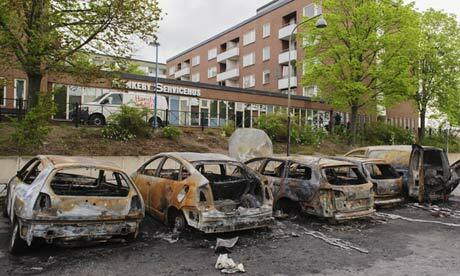 Despite Sweden’s reputation for equality, the rioting has exposed a faultline between a well-off majority and a minority, often young people with immigrant backgrounds, who cannot find work, lack education and feel marginalised. …. The gap between rich and poor in Sweden is growing faster than in any other major nation, according to the OECD, although absolute poverty remains uncommon.